What Animals Live in Australia? 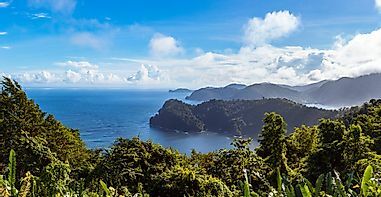 Australia hosts an array of incredibly unique environments with a wide range of biodiversity. The sugar glider is one of Australia's unique animals. 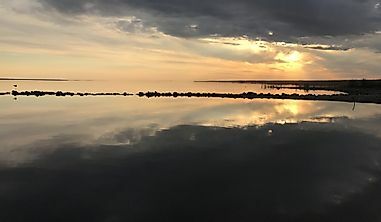 Due to its unique climatic and geological conditions, Australia is known for its distinctive creatures. 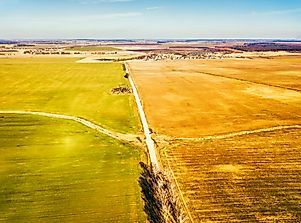 Although kangaroos, spiders and poisonous snakes are common animals that come to mind when thinking about Australian wildlife, there are many other animals that are native to the country. Here are 10 other animals that can be found in Australia. 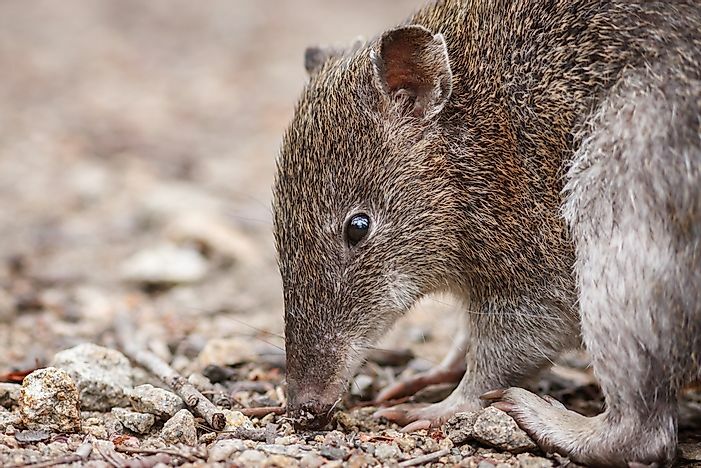 A closeup of a bandicoot. Bandicoot are small creatures with a tapering snout, an arch-backed body, long legs, and a thin tail. Together with bilbies, they are marsupial omnivores. Although there are at least 7 species of bandicoot in Australia, the majority of them are endangered. A box jellyfish in an aquarium. 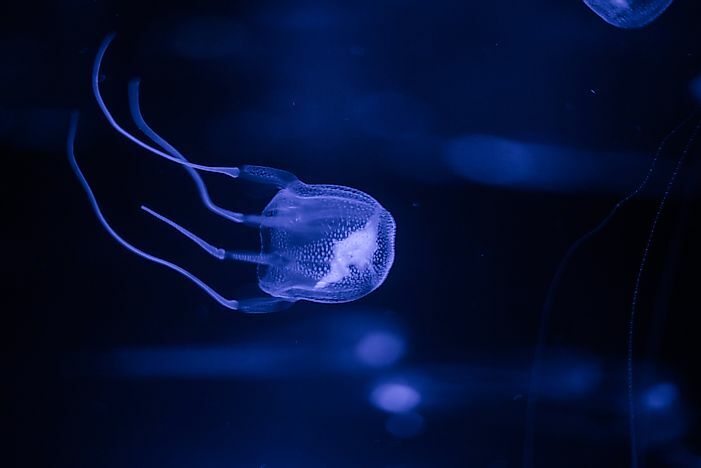 The box jellyfish is cube-shaped with four distinguishable sides, hence its name. It has multiple tentacles on each corner of its sides and is a highly venomous invertebrate. Known as the most venomous marine creature, the jellyfish can cause lung failure and death in humans. The dugong is the only marine mammal in Australia that is herbivorous. 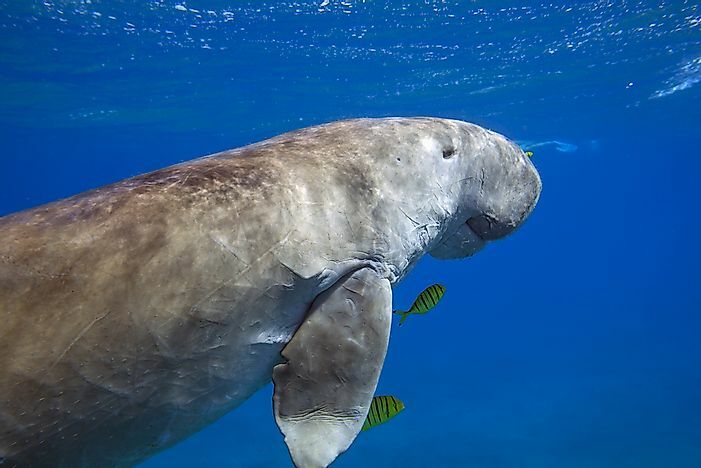 Feeding on sea grass in coastal areas, the dugong has been recorded to weigh as much as 400kg and can grow up to 3 meters long. Due to constant hunting and destruction of seagrass beds, it has become an endangered species. 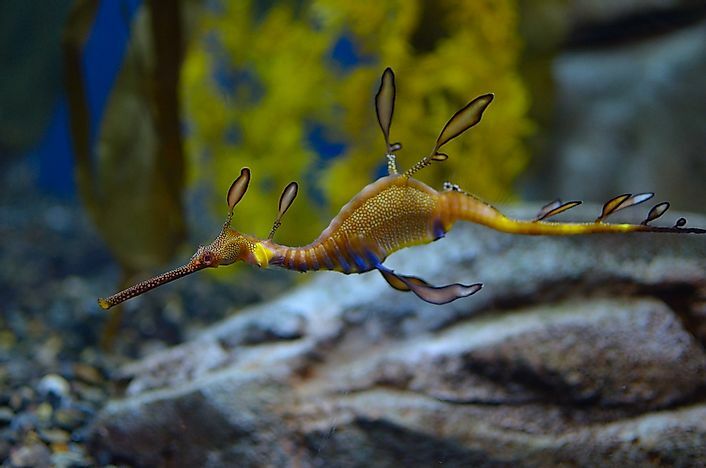 The weedy seadragon is one of two species of seadragons. They bear a resemblance to seahorses, although they have a greater number of leaf-like appendages on their bodies. They have small pectoral fins on both sides of their neck and a long dorsal fin along their back. The fins are used for balance. Weedy seadragons live in seaweed beds and rocky reefs. 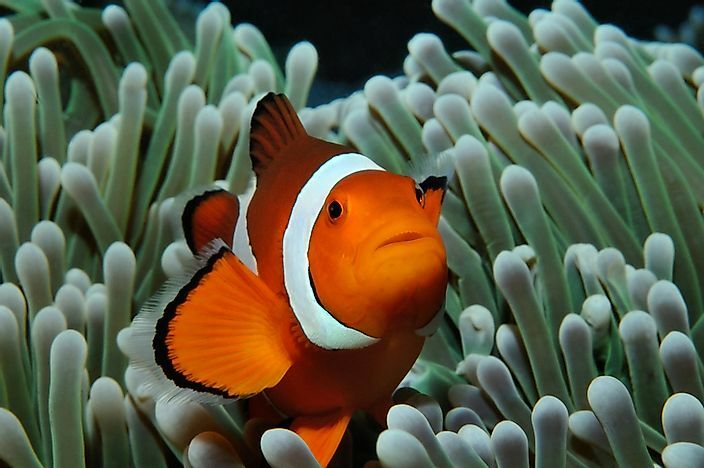 A clownfish in a sea anemome. The ocellaris clownfish is a small fish that grows to about 11 cm long. 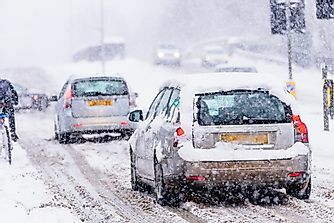 Generally, it has an oval shape and a stocky appearance. The Australian ocellaris is popular for its different body colorations, and for being featured in the famous Disney movie "Finding Nemo", which takes place in Australia. 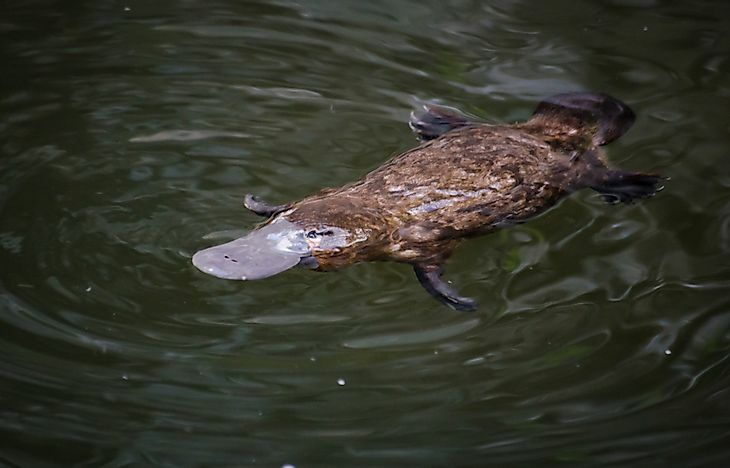 A platypus swimming in the water. The platypus is notable for being a mammal that lays eggs. When platypus were first discovered, those who heard about them thought them to be a hoax, mainly due to their unique appearance and elusive behavior. Playplus only live in Eastern Australia, and are somewhat similar to a beaver in appearance. 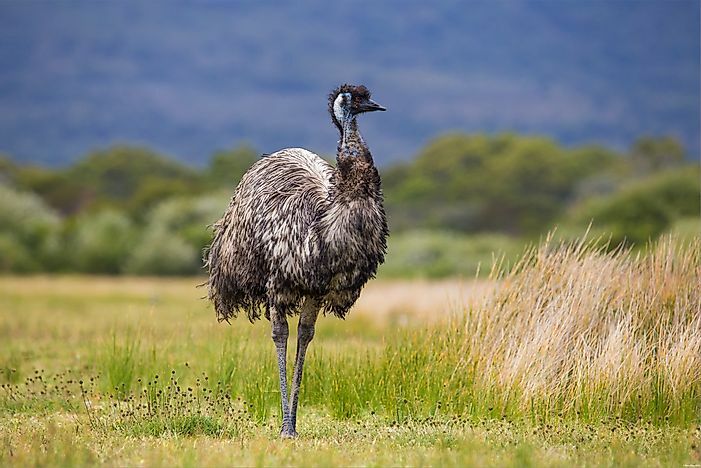 An emu is the second largest species of bird in the world. The emu is a notable Australian animal - its image is even engraved on Australia’s coat of arms. The bird is the second largest species of bird after the ostrich. Known as the indigenous bird of Australia, the emu is a brown bird characterized by soft feathers, a long neck, and long legs. Just like the ostrich, the emu does not fly. 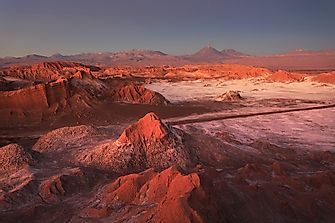 Its optimum height is 1.9 meters. The emu is known to travel long distances and its limbs are strong enough to enable the bird to reach speeds of 50 km/h when necessary. 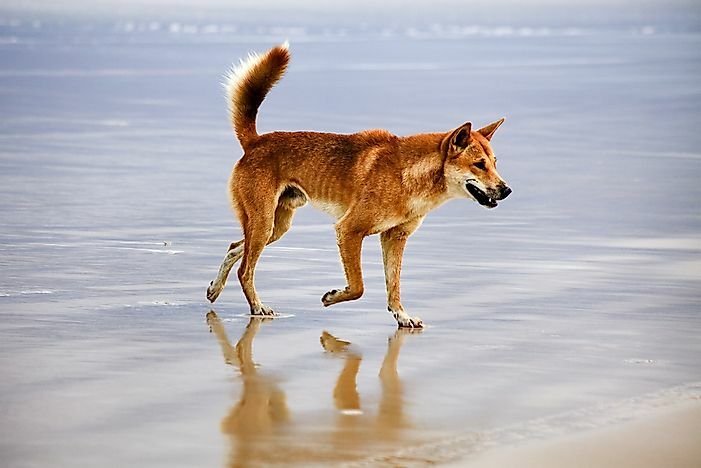 A dingo on the beach in Australia. The dingo resembles a wild dog but has a few differentiating body features. It has upright ears, a pointed muzzle which is quite longer than a dog’s, and a comparatively broad head. The dingo was the first foreign placental mammal to be introduced to the continent around 4000 years ago. Adapting to the climatic conditions of Australia, the dingo survived and still exists in the wild today. A sugar glider in a tree. The sugar glider is a species of gliding possum that has striking similarities to the flying squirrel, the most prominent being its ability to glide through the air. The animal has membranes called "potagiums" which extend from the first toe of its hind limbs to the last toe of its forelimbs. The membranes aid the possum in gliding between trees. 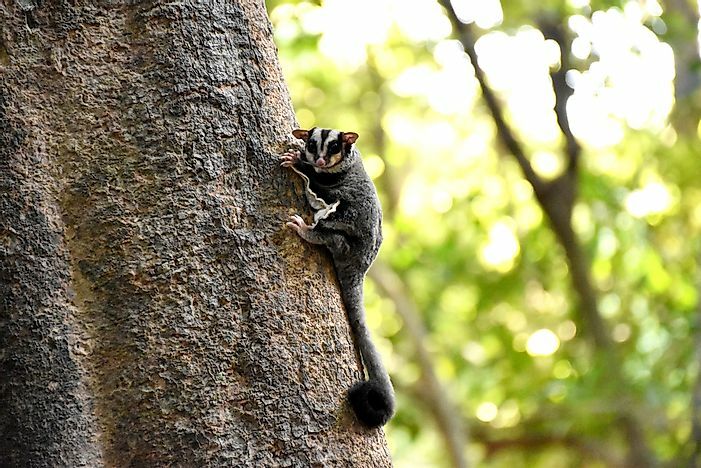 Commonly found in eucalyptus forests in Eastern Australia, the sugar gliders vary in size and belong to a different group of arboreal marsupials. The spikes of the echidna act as their defence system. 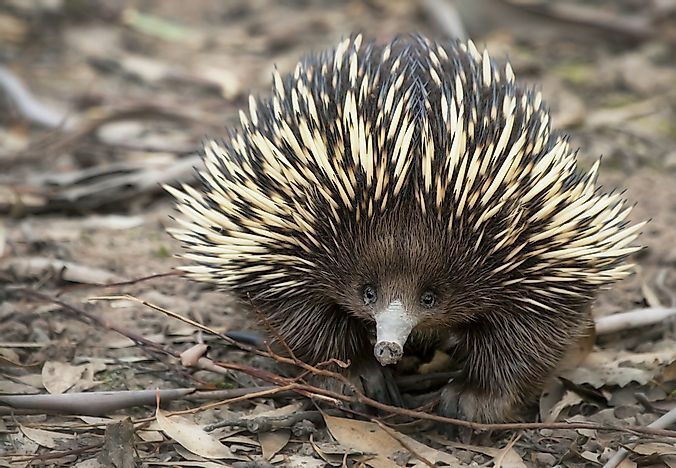 There are only two egg laying mammal species in Australia, the short-beaked echidna being one of them. The short-beaked echidna has a tubular snout, powerful forelimbs, and a tongue that can move in and out to capture hundreds of termites in minutes. Hairy spikes cover the animal which are its primary defence mechanism. When attacked, it curls up into a ball and deters the enemy with the spikes. 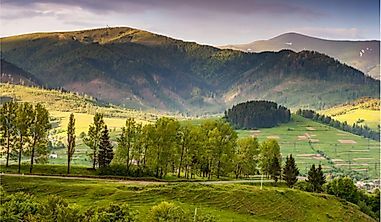 This page was last updated on May 12, 2017.